It is no surprise that the Super Bowl leads to a massive amount of food consumption in the US. We gear up for a lot of parties and entertaining in conjunction with the big game. Indeed, the US Department of Agriculture reported that Super Bowl Sunday is the second largest day of food consumption in the US, behind Thanksgiving. Several stories circulated in the run-up to the big game detailing certain aspects of the scale of our consumption, including the fact that approximately 1.25 billion chicken wings would be consumed on Super Bowl Sunday along with 100 million pounds of avocados. Billions of hamburgers and millions of pizzas would be eaten over Super Bowl weekend as well. Caught up in the festivities, we’re not too focused on minimizing food waste. 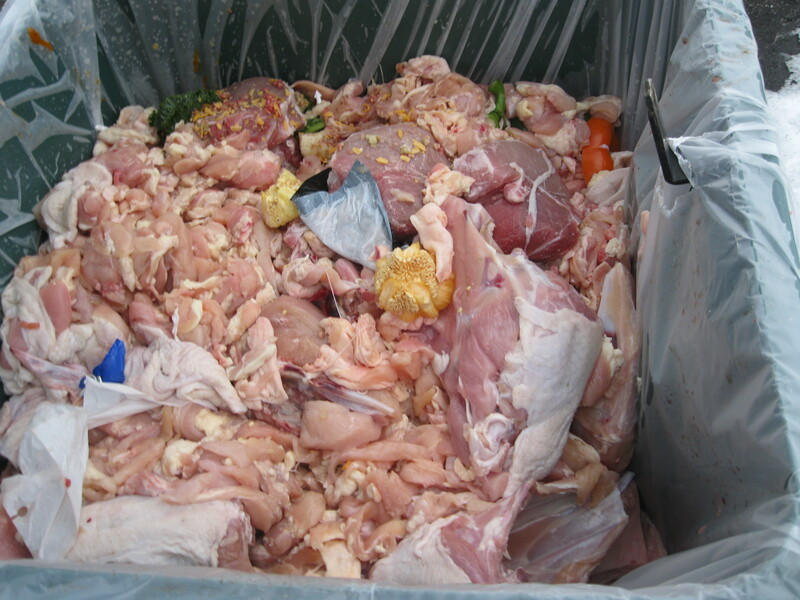 Yet that spike in consumption exacerbates the high level of waste that already exists in the food supply chain — as indicated by the attached picture of discarded chicken and beef from Super Bowl Sunday afternoon. Such food items are key sources of protein which could be redistributed to the needy through food recovery partnerships between supermarket chains and charitable food organizations. These partnerships have a triple bottom line impact — benefiting people, reducing environmental impact, and improving income by reducing costs (through reduced trash haul expenses, tax deductions, etc.). In addition, such partnerships have a positive impact on the workforce of donor organizations — both in terms of morale and innovation. Employees respond favorably knowing that they are working for a good corporate citizen, and they are motivated to look for other opportunities to reduce waste (and hence costs) in the operation. Feeding 9 billion people by 2050 requires a shift in our thinking and in our actions toward sustainability and resource optimization. We cannot afford to waste such high quality food — especially considering the high value of all of the resources that went into producing it. We need to embrace sustainable intensification — doing more with less in a sustainable manner — in order to safely feed the global population while preserving resources for future generations to do the same. Partnerships to capture and redistribute excess food at the supermarket level are a great opportunity to start on that path. I am reminded of a recent post by the Natural Resources Defense Council which noted that this past year (2013) is the year that the US woke up to the scope of the food waste problem and the need to do something about it. Like the Super Bowl, it is a super-sized issue — one that needs to be addressed at multiple levels of the food supply chain — and quickly. The benefits of action are many, and the costs of inaction are great. Great post. Hard to find an article of this quality.